Rifton large adaptive tricycle are designed to be flexible and adjustable for all ages with no tools required. 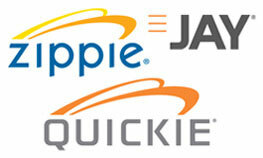 Adaptive tricycle provides therapeutic, reciprocal exercise with all the fun of riding. Adaptive tricycle is often medically necessary for someone who cannot walk independently or who sits for long hours in a wheelchair. 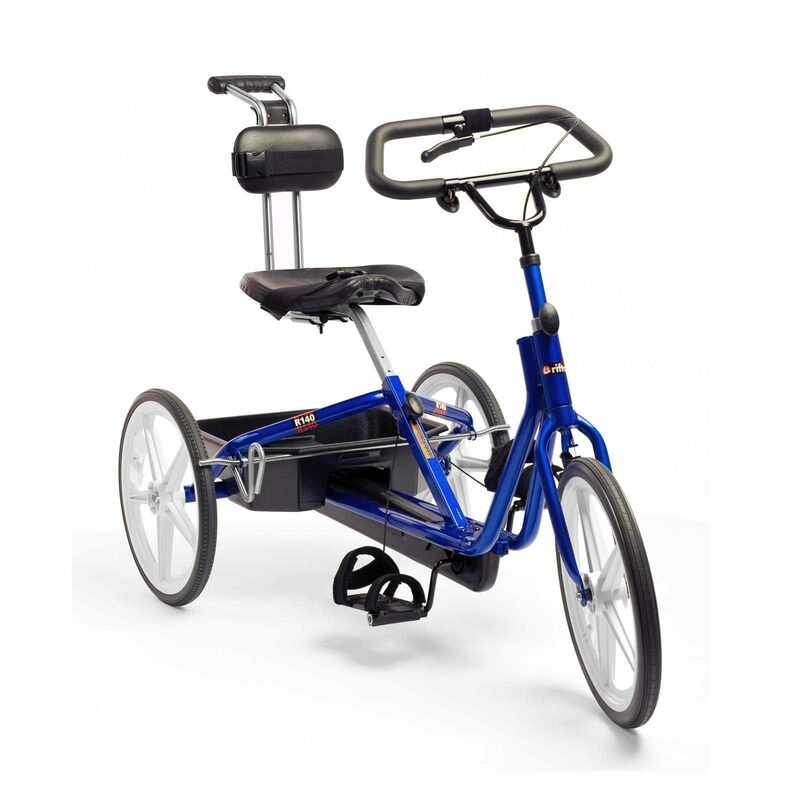 Adaptive tricycle provides fun, motivating activity for improving leg strength, balance, fitness and endurance. Clients with special needs can zoom around right alongside their peers on a tricycle that’s as cool and colorful as anything on the sidewalk. 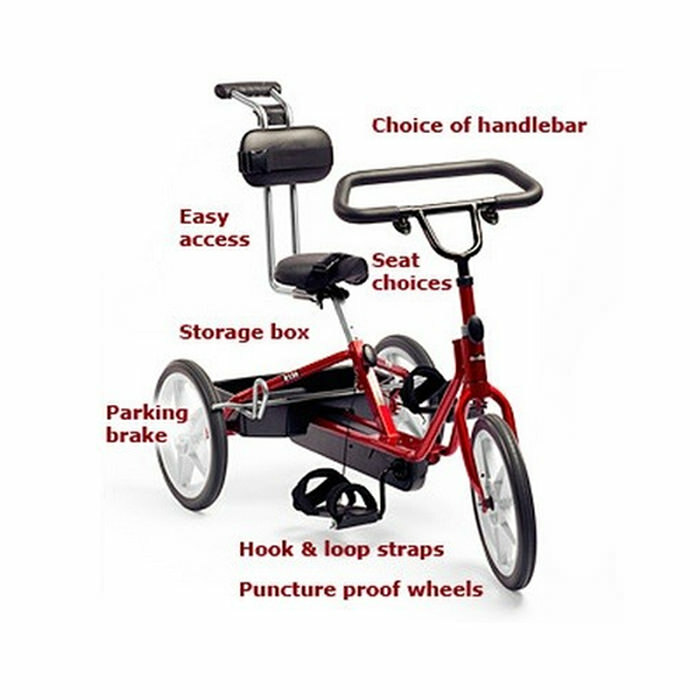 Rifton adaptive tricycle’s open access combined with a low transfer step make it easy to get on and off the trike. Tricycle has a tote box at the back of trike for storage or for transporting items. With the hook and loop straps on the self-leveling pedals, feet are secure. Adaptive tricycle handlebar can be lowered or raised and then locked in place. Trunk support system is ideal for riders who have trouble remaining upright while seated. Client can ride unaided, having healthy exercise and fun. 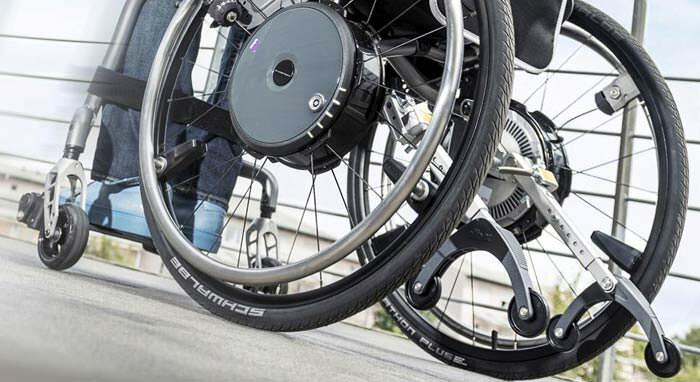 Adaptive tricycle has puncture proof BMX-type wheels. A low gear ratio makes pedaling easier for beginners and slows down speeders. The easily engaged parking brake grips both back wheels and keeps the trike firmly in place. Available in 4 colors- Red, Blue, Lime and Raspberry. Puncture proof wheels- Puncture proof BMX-type wheels. Storage box- There's a tote box at the back of trike for storage or for transporting items. Hook & loop straps- With the hook and loop straps on the self-leveling pedals, feet are secure. 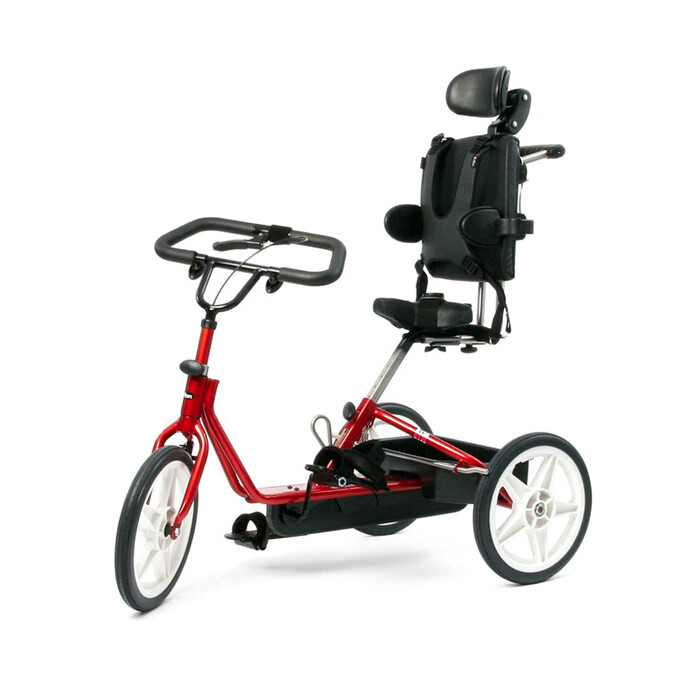 Easy access- Open access combined with a low transfer step makes it easy to get on and off trikes. Parking brake- Easily engaged parking brake grips both back wheels, and keeps the trike firmly in place. Choice of handlebar- Choose a traditional handlebar with conventional handgrips or a padded loop handlebar for extra support. Seat Size 12" x 16"
Maximum Working Load 200 lbs.